Ever have one of those world-mixing dreams, where people you knew from grade school suddenly show up at your workplace and it just seems natural that everyone knows everyone else? 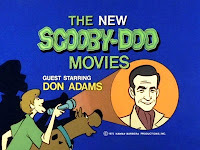 Such was the world of “The New Scooby-Doo Movies,” which aired from 1972-1973, and eternally ever after in reruns. Each episode featured a truly bizarre real-life or fellow cartoon guest star who just happened to show up to help the gang pull the latest rubber mask off the latest criminal gardener. It was like the All-Star game of cartoons. Guests who were already dead in real life? Laurel and Hardy. Guests who just wouldn’t go away? The Harlem Globetrotters showed up three times. Most awkward guests? Sonny and Cher were just as mean to each other in cartoon form as they were in real life. But perhaps no guest put up with more than Mama Cass Elliott, who was the target of fat jokes from Shaggy, and was drawn with a double chin and orange-and-magenta muu-muu. Zoinks! I think it would have been way cool if they could have had Scooby and the Gang meet the Ramones!